The Rickie Miyake Blog: The Helms Man Is Here! Normally I take the weekends off from blogging, but since it is the 4th of July three-day holiday, I decided to publish these "special editions" - yesterday's post about Tito's Tacos, and today's post about our visit to the Helms Bakery District. Are you old enough to remember the Helms Man and the Helms Truck he drove? I am, sad to say. I remember listening for the familiar honk/whistle of the truck coming down our street, then running out with the money my mom had given me to get either a small or large loaf of bread. And sometimes she gave me an extra nickel to get a doughnut. I normally went for the powdered sugar ones. I hadn't been to the Helms building since our elementary class took a tour there many moons ago. 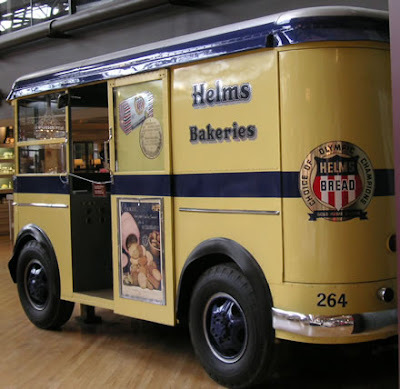 I remember each of us received a small loaf of bread packaged in a carton resembling the Helms Truck, like pictured above. 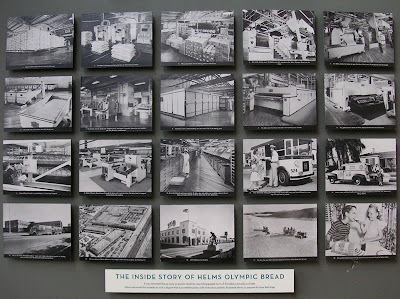 Helms Bakery went out of business years ago and now the building has been refurbished into a huge furniture complex along with restaurants (Fathers Office being the most notable of the new tenants). The truck seemed smaller than I remembered it, but then I was a lot smaller, too. I still remember our Helms Man's name: Lauren. Or maybe it was Loren. Or maybe Lawrence and I had a speech defect. And I still remember what he looked like - a little bit like Art Linkletter. Lauren (or Loren or Lawrence) was a nice man. He kept a shiny silver coin changer around his belt since most transactions could be accomplished with coins back then. Back in the day, the Helms Truck would visit our neighborhood daily, as would the Adohr Farms milk truck. The Japanese Fish Man would come once or twice a week in a big green truck that sort of resembled the brown UPS delivery trucks. We also had the Watermelon Man. This guy would come through in an old pickup truck piled high with watermelons, announcing over a bullhorn, "Watermelon Man is here now. Get your juicy, sweet watermelons!" My friend Edwin Kasakawa and I would run behind the truck yelling, "Watermelon Man is here now! Get your rotten watermelons with bugs in them!" And the Watermelon Man would mumble for us over the bullhorn to shut up. Edwin was actually an EMR (educable mentally retarded) but I don't know what my excuse was. The picture below was taken at H.D. Buttercup, one of the stores within the complex. The reason I took it is because my mom has this exact same album! 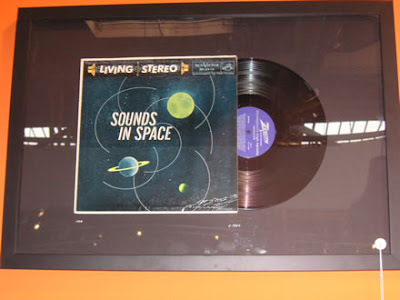 It was released in the 50's when stereo recordings were a novelty, and it's one of those demo records that have sounds moving from one speaker to another (like ping pong balls, etc.). They were selling this work of art for $395.00. As we walked down the street, I just had to snap the picture below. 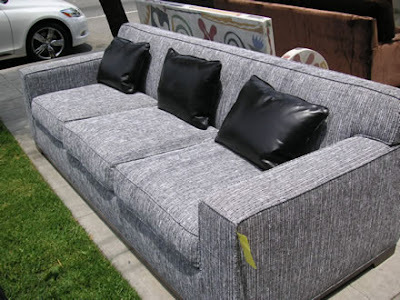 That's one of the ugliest sofas I've ever seen.. it's like a bad sportcoat. My apologies (or sympathies) if you have one just like it sitting in your living room. Actually, it looks like something you might have found in a typical Issei or Nisei house back in the 50's or 60's, lol. Sometimes retro goes too far. Yes, I remember the Helms man, but not his name. Do you remember the burrito man? Sold Ramona burritos out of his truck. .35 cents for a meat and potato burrito. I remember he was huge! Do you remember the Captain Crunch whistle? I used to down 5th Avenue on my Schwinn Speedster blowing a CC whistle. Ladies would come out with their purses a half block behind me thinking I was the Helm's Man. I hope I've matured a little more since 1962. BTW, I just got back from The Yard where my little one is a Plebe. Hope your Ensign or 2nd Lt is doing well. Drop me a line and we can do lunch, I'm off for the summer. I really wish there was an edit function. I used to "bike" down 5th. It really is a vivid memory. I learned how to ride with no hands and enjoyed the freedom of just going to a friend's house. Hey Donna y Hiro! I don't recall any burrito man. I didn't even know what a burrito was back in those days! We just had the Helms, Adohr, fish and watermelon men coming around. I guess your burrito guy must have had a lot of inventory mysteriously "disappear." Hiro - I see you must Google your name on a regular basis, eh? lol.. I only remember the Oscar Mayer weenie whistle. Now blowing that whistle sounds like something I would do. BTW, congrats to you on your kids! Greg is in Corpus Christi now. And yes, let's get together soon - I'll drop you a line (you can reach me at my name at gmail, too).